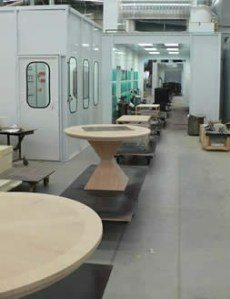 The finishing process stage for a furniture manufacturer was causing a bottleneck in their process. There was only one spray booth, and workers constantly had to manually move furniture pieces in to and out of the single booth. Now imagine that their furniture had a four-coated stain finish and furniture pieces had to be stored around the plant for curing between each coat and intermediate sanding steps! All this commotion meant valuable time and floor space were not being used efficiently or effectively. On top of that, the furniture varied in size and weight from 5 lbs – 200 lbs and were cumbersome to move manually through the various finishing processes. A system was needed that would eliminate the bottleneck, increase production rates, minimize handling and reduce “work in progress” storage space. To create a solution, the furniture manufacturer would require additional spray booths in the plant; no system could run effectively with just a single booth present! PACLINE provided a customized PAC-TRAK™ Towline system which would allow workers to be freed up to be able to work more effectively. Pacline engineered a 420 ft on-floor towline that would transport furniture through multiple spray booths allowing for every item, no matter its shape or size to flow through each step of the finishing process in a timely manner. New carts were created allowing the top platen to be automatically rotated in close-pack accumulation areas or manually in the spray booths. The system also allowed for variable speed operation to accommodate both simple and complex items. Our inverted PAC-MAX™ system is also a great alternative to a chain-on-edge conveyor. At the maximum 9 FPM production speed, raw pieces could be completely finished in only 83 minutes resulting in elimination of the prior bottlenecks. To read about the RESULTS and full Pacline Case Study click here.